Solid State Logic has decided to bring their legendary sonic sculpting to the masses, and you’ll be as thrilled with this software-based solution as we are. The complete SSL Native Plug-In Collection gives your DAW the sonic character of an SSL console without the pricey hardware investment. Many companies have produced software emulations of various bits of SSL hardware, but who better to turn that sonic gold into software than the people who actually make the hardware? 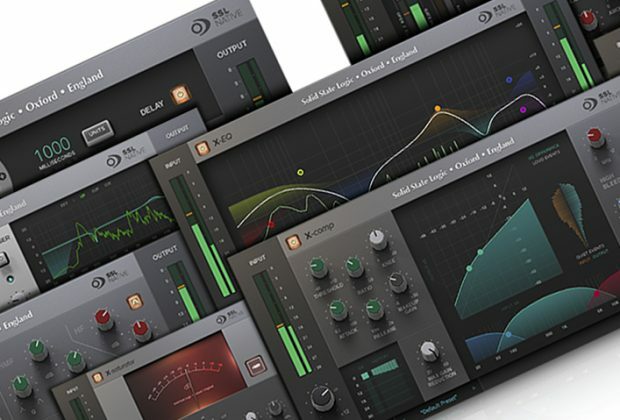 The SSL Native Plug-In Collection is available for purchase or via an affordable monthly subscription. You get ten plug-ins that deliver legendary SSL bus compression, saturation, equalization, and phase control. To say that this plug-in bundle makes a nice addition to your studio would be heretical. For all practical purposes, it has become our go-to hardware emulation software, not only for its breadth, but also for its sonic depth. Sit back in your virtual Herman Miller studio chair as we explore what is easily the plug-in bundle of the year. All ten of SSL’s Native Plug-Ins are included in the subscription bundle (they can be purchased individually or en masse if you hate subscriptions). These include the Channel Strip, Bus Compressor, Drumstrip, Vocalstrip, X-Saturator, X-EQ, X-Comp, X-ValveComp, and X-Phase. 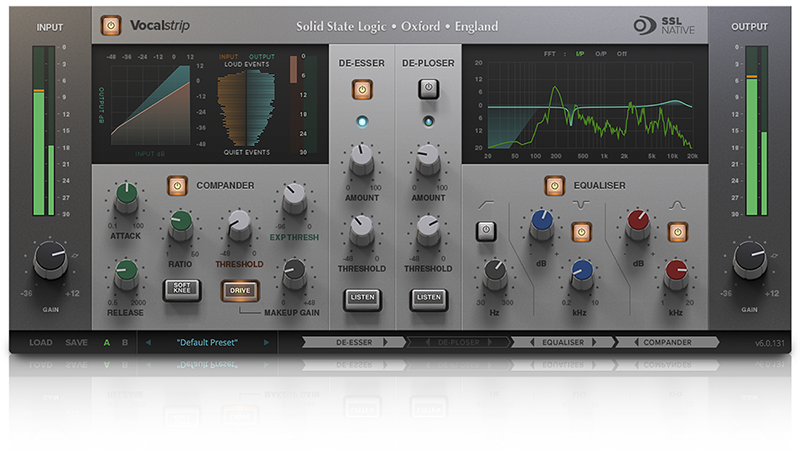 Channel Strip includes legendary SSL console EQ and dynamics processing. Specifically, four-band EQ with two shelving sections, and two parametric sections with the capability to switch between E&G Series emulations. Side-chain processing, variable low and high pass filters, as well as process-order routing, are included. 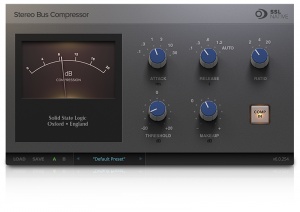 Bus Compressor is the classic 1980s G Series compressor found in the console for which it is named. Simply put, this compressor gives the cohesion and “glue” that represents the iconic sound on almost every hit record for the last 30 years. Drumstrip is another indispensable tool, featuring transient shaping, gating, high and low frequency enhancers, level-metering, and fully adjustable process ordering. Vocalstrip is the sister chain to Drumstrip offering similar tools but a more refined graphic selection, De-esser, and De-ploser, as well as compression and downward expansion via the SSL compander. X-EQ is a ten-band parametric equalizer. X-ValveComp provides valve compression and second-order harmonic saturation and distortion. 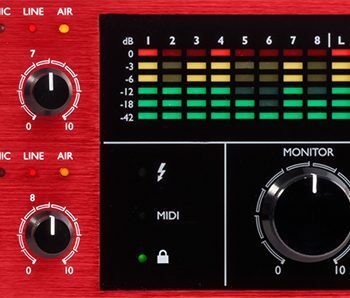 X-Comp is a mastering-grade stereo compressor and brick-wall limiter, with a beautiful graphic display especially useful for graphic knee control. X-Phase is a useful plug-in for controlling phase issues. X-Saturator adds grit and third-order transistor distortion not often heard from in-the-box, fully digital recordings. FlexVerb is a new addition to the Collection, bringing classic, studio-style reverb generation to your DAW. It provides a host of editable options including separate control over early and late reflections, a six-band EQ, high- and low-pass filters, and more. 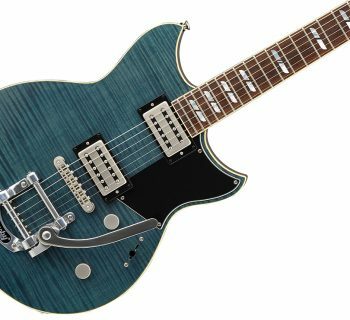 We didn't have an opportunity to evaluate its sound for this review, but will add additional comments after we've had a chance to explore this plug-in further. Jam-packed with features and control, this bundle is extremely versatile and incorporates many classic SSL textures. It runs in AAX Native, VST, and AU formats, and all require an iLok for authorization. 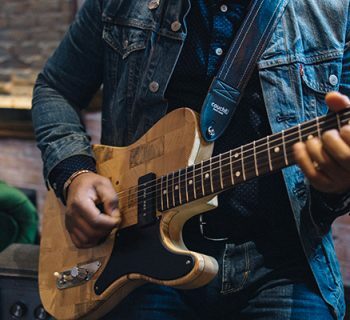 Integrating the SSL Native bundle collection was simple and seamless. We tested the plug-ins with both an Apple Mac Pro (3.4GHz Xeon) and a custom-built audio PC workstation with a Dual CPU setup (3.0GHz 48 cores). After installation we immediately utilized the Bus Compressor on most of our parallel processing. The interfaces for all of the channel strips and plug-ins have a classic SSL look and were easy to navigate. Within a week of installation, the SSL bundle had become part of our standard audio chain and/or replaced many of the plug-ins we had been relying upon for years. The SSL plug-ins were used on everything from hip-hop to metal and all shades in between. We found no restrictions whatsoever to any genre. Because of the classic SSL interface design each of the plug-ins can be easily understood and delved into without reading a manual. Moreover, plenty of excellent presets were provided to get things up and running quickly (especially useful for engineers new to SSL). Starting with the SSL presets was like having a teacher there with us—very convenient and didactic. Without question SSL has been known for the sonic quality of their analog consoles, equalizers, and compressors. Recreating that sound in the digital domain for Native plug-ins is another matter entirely. Nevertheless, we can say with confidence that SSL has done an incredible job in this regard. Everything that we put these plug-ins on sounded better for it. Drums sounded bigger and punchier, guitars had growl without harshness. Bass was fat and defined. Vocals floated in the center of the stereo field without popping out too much, and keys and other virtual instruments gained warmth and clarity. One of the most interesting tests we did involved comparing the SSL Bus Compressor with the popular Steven Slate FG-Grey emulation on the drum bus. There was an immediate difference to be heard, particularly in the upper mids. The Grey emulation exhibited a harsh pokiness above 6K while the SSL Bus Compressor had all of the pop in the mid-range without any harshness in the same area. The net result in this case was much less time being spent getting the snare to sit perfect in a dense rock mix. This is a sonic characteristic of SSL’s that many top mixing engineers and producers have come to rely on, and now it’s available to almost everyone. The only way we could see someone not heavily relying on this package is if they don’t like the SSL sound. But if you love SSL sound as much as we do—and we’ve worked on the real deal hardware, we found the sound absolutely comparable, if not equal. The entire plug-in bundle leaves no stone unturned. Everything from great single voice tracking, dense mixes, and transparent mastering were all well covered by this collection. Of course, the best way to demonstrate what we have described is to provide some audio examples. We will feature with and without processing. First up is Russell Gargula of Icelus with his drums through the SSL native Bus Compressor. Last we have Leo Croft demonstrating the power of the Vocal Strip on his rap rendition of “Somewhere I Belong” by Linkin Park. The SSL Native Collection complete bundle documentation is stellar, and the website provides user manuals and video tutorials to get you up and running in a hurry. All documentation was easy to find and comprehensive. The SSL Native Complete bundle sells for a lofty $1,599, but a software subscription sells for just $14.99 per month, a solid value. If you’ve been looking for a simple way to make everything in your studio sound better at a reasonable price, there’s no longer any reason to seek SSL emulations from anyone else. There’s a new emulation benchmark for Native SSL sound, and rightfully, it comes from SSL themselves.